A strange ritual of sorts has emerged for me during late pregnancy. It’s not the ritual of freaking out about how messy our house is, and we urgently need to clean and unclutter (though that happens). It’s not the ritual of cramming our infant car seat into the car, and cursing because “why are these things so damn difficult to install?” (thankfully Steve is our resident car seat installation expert). I’m talking about the weird ritual of cooking gumbo. Every time I’m in the last month of pregnancy, I have the urge and instinct to make a huge pot of gumbo. A week before I had my firstborn Aaron, I made gumbo that served as our final meals before going into labor. I also had the foresight to freeze batches for later, when we were in the throes of caring for a newborn. Later, when Alex’s arrival was imminent, I did the same thing. Here I am with our third child on the way, with a newly made stock pot of gumbo sitting in the fridge. Gumbo takes a lot of time and love. Maybe that’s a metaphor for us preparing to welcome a new baby into the family. I dunno, my brain is fried these days. Anyway, gumbo. It’s a long, slow process of chopping, searing, roux-stirring, and simmering. You can’t rush it, so it becomes a practice in slowing and meditating. But oh how the result is worth the work. 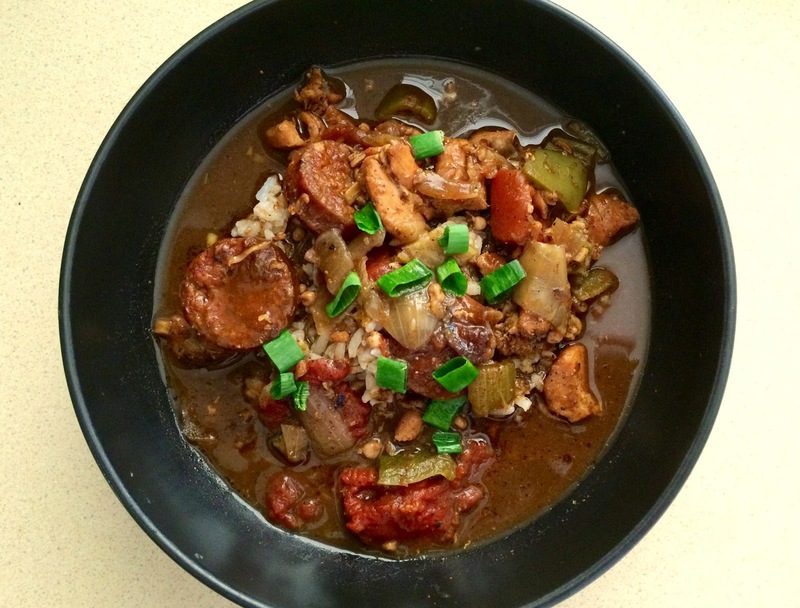 This gumbo is rich in flavor, owing its deliciousness to the dark roux and perfect Creole spice blend. 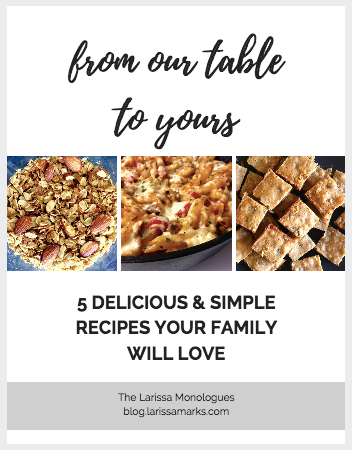 I’ve made this with various meat combinations, including shrimp or other seafood. But I think I like the simplicity of chicken and sausage best. In a large cast iron Dutch oven or stock pot, heat 1 tablespoon vegetable oil over medium-high heat. Add sausage, and cook until well browned, about 8 minutes. Remove sausage and drain on paper towels. Set aside. Season chicken with Creole seasoning and add in batches in the oil remaining in the pot. Cook over medium-high heat until well browned, about 5 minutes. Remove chicken, let cool in a bowl, and refrigerate until ready to use. Combine the remaining 1/2 cup of oil and the flour in the pot over medium heat. Cook, stirring slowly and constantly for 20-25 minutes to make a dark brown roux (the color of chocolate). Add onions, celery, bell peppers, and garlic, and cook, stirring until wilted, about 4-5 minutes. Add the sausage, salt, cayenne, and bay leaves. Stir and cook for 2 minutes. Stirring slowly add the chicken stock, and cook until well combined. Bring to a boil. Reduce heat to medium-low and cook, uncovered and stirring occasionally for 1 hour. Add chicken, tomatoes, and okra to the pot, and simmer for 1-1/2 hours, skimming off any fat that rises to the surface. Stir in file powder and green onions. Serve over rice, with hot sauce as needed. Makes 6-8 servings.